Embracing classic pop hooks, throwing in a bit of soul, Brit pop and California sunshine, Loomis & the Lust has created a top notch pop rock sound that swirls with a light-hearted, fun-time attitude that conjures up visions of palm trees and good times. 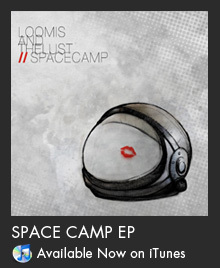 After releasing a batch of clever, catchy songs in their first EP last year, Loomis and the Lust quickly started making waves, being named one of the “Top 25 New Bands in the World” by MTV Iggy, winning an mtvU “Freshman” video award, and appearing in an online ad campaign for Subway. All their songs are danceable and contain so much energy that if you don’t move a body part while listening, you most likely don’t have a pulse. “I’ll put it to you this way, within about thirty seconds you’ll be reeled in and singing into a hairbrush”, wrote one reviewer about the band’s single “Bright Red Chords”. They have been described as taking the best parts of rock & roll from the past, adding a little funk, a little Cali surf and molded it into something modern that still captures that same feeling as listening to Beatles or the Rolling Stones for the first time.